Spectra, the provider of Venue Management, Food Services & Hospitality and Partnerships at Alerus Center, is excited to announce the Big Ticket Giveaway presented by the Greater Grand Forks Convention and Visitors Bureau. 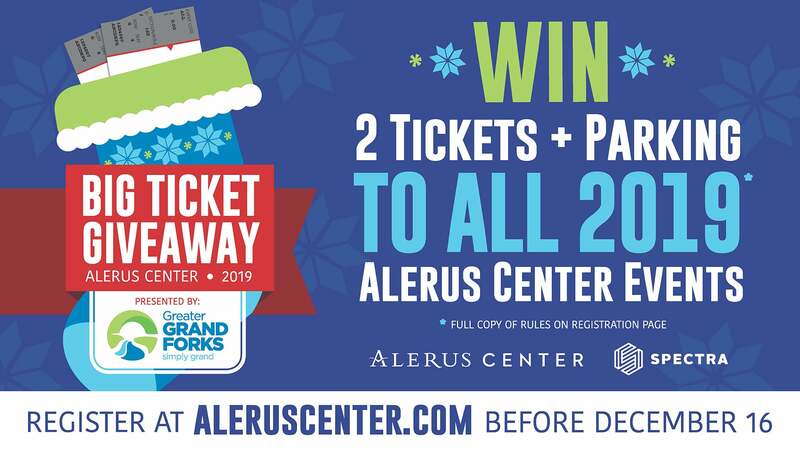 The Big Ticket Giveaway presented by the Greater Grand Forks Convention and Visitors Bureau will award one lucky fan with two club tickets to every publicly ticketed event at Alerus Center for *one year. Fans can enter the sweepstakes beginning at 10 a.m. CST on Friday, November 16 online at www.AlerusCenter.com by clicking on the Big Ticket Giveaway presented by the Greater Grand Forks Convention and Visitors Bureau banners, buttons and links to access the online entry form for the sweepstakes. All entries will be collected until Sunday, December 16 at 11:59 PM. The Big Ticket Giveaway presented by the Greater Grand Forks Convention and Visitors Bureau will include tickets to concerts, family shows, sporting events and more! The upcoming calendar year will include a number of world-class entertainment including Dierks Bentley, UND Football, Harlem Globetrotters, Hugo’s Toughest Monster Truck Tour, Paw Patrol Live, Happy Harry’s Beer and Bacon Festival, and additional events yet to be announced at Alerus Center. *The winner will receive two (2) club tickets to each ticketed event held at Alerus Center for one year (January 1, 2019 – December 31, 2019).